Stop Now & Check out These 5 Bollywood Weddings to Take Your Wardrobe up a Notch | Wedding Tips ARE YOU A VENDOR? As magazines gush about Bollywood weddings, we have curated a list of silhouettes adorned by your favourite actors on their big day. Take out your pen to jot down some notes if you wish to look like a showstopper at your own wedding function. 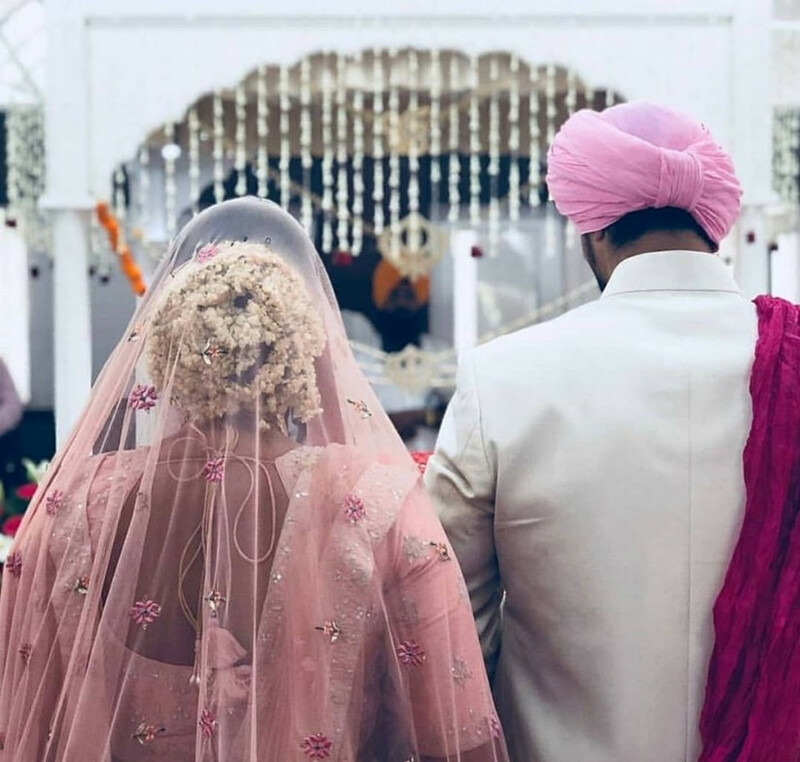 From intimate, cosy weddings to a glamour decked Punjabi wedding ideas, our Bollywood actors have done it all in their breath-taking Bollywood weddings. Apart from the sheer grandeur of their celebrations, what is that one thing no bride-to-be or groom-to-be can keep themselves from gawking? Their bridal outfits, of course! 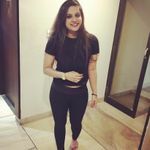 A soulful blend of artistry and craftsmanship, their outfits become the talk of the town for months and not only through word of mouth but magazines and media channels and blogs all cheer the glamour statements made by each of these celebs. We bring to you 5 Bollywood weddings which reigned over the internet and the minds of people because of their outfits. Take inspiration from these stunning wardrobe choices to curate your own wedding trousseau. 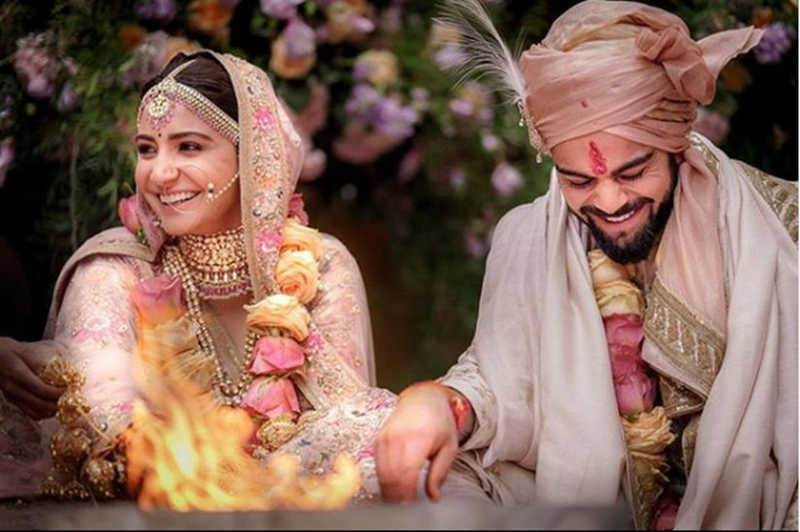 Tinseltown and Cricket’s Ram Milaayi Jodi, the Virushka wedding was a gushy, romantic tale that we all loved. And their wedding wardrobe was a game changer for all. Master crafter Sabyasachi thoughtfully curated a colour palette for the couple’s outfit, to complement the scenic beauty of their Italian wedding venue. 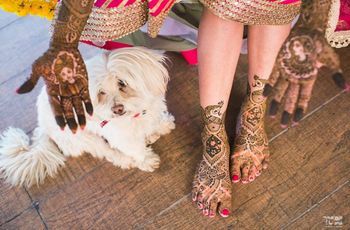 To bring out the beauty of the bride in its most pristine form, the designer ensured that everything from the decor to the outfit was in sync with one another. Her outfit had a renaissance embroidery in a vintage English colour palette of subtle shades that are pleasing and yet gorgeous to look at. 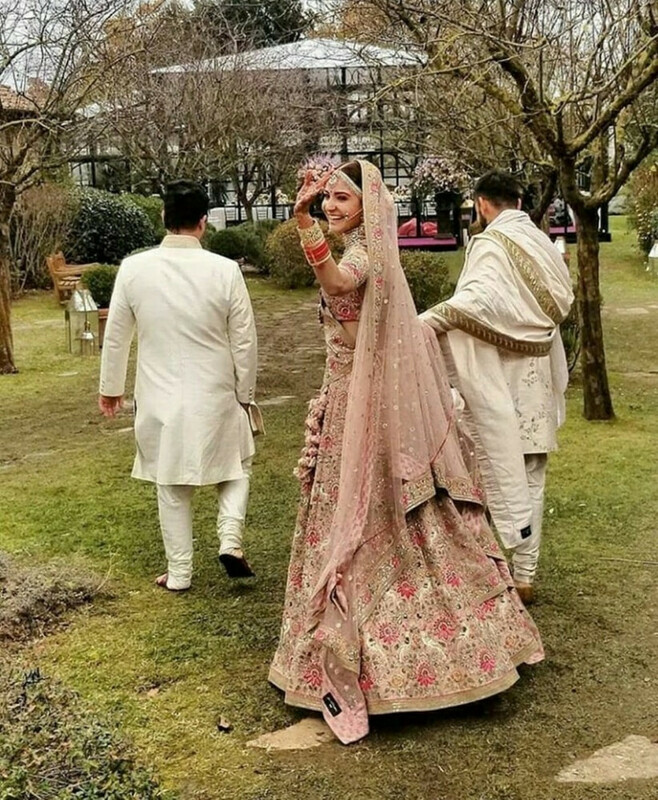 Anushka’s lehenga choli had all the flora and fauna from the Garden of Eden in silver and golden threads with the hints of different shades of pink and peach to add the perfect colour touch. These shone spectacularly owing to pearl and beaded details. On the other hand, Virat adorned a classic ivory sherwani. It was a hand embroidered ensemble with a Tussar stole and a custom woven Chanderi Safa in shades of gold. We were wowed by the picture of dulha that he has successfully imprinted on our minds. We have the groom wear goals established and we have Virat Kohli to thank for this wonder. 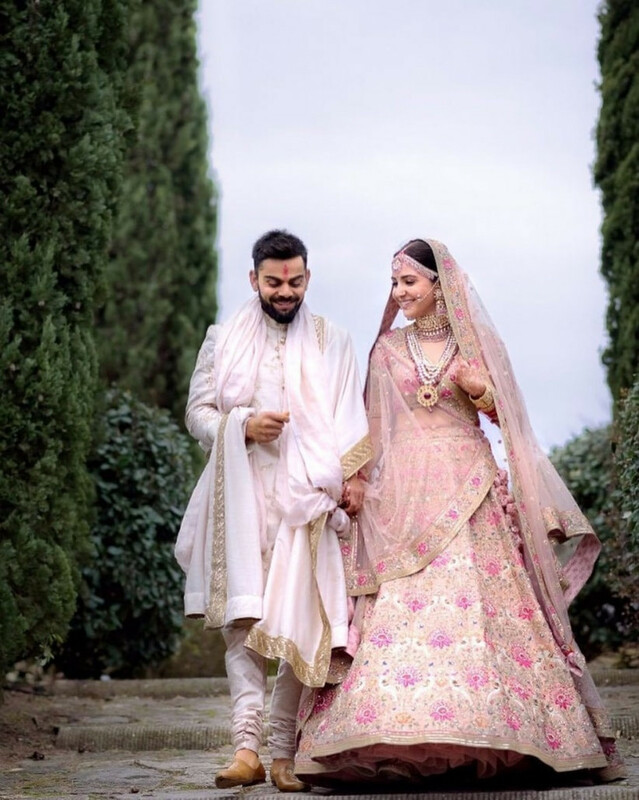 Though Virat’s ivory sherwani was not unique, it made quite a splash when pictured alongside Anuska’s refreshing peach-coloured pastel lehenga. 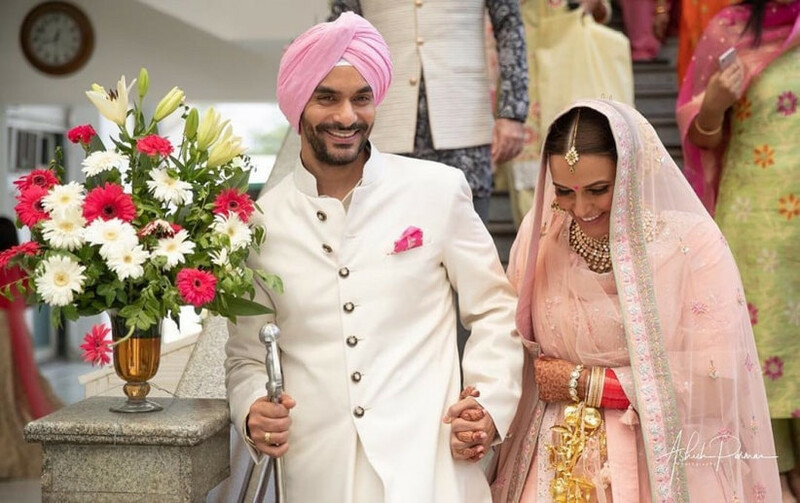 Their outfits surely made it one of the most memorable Bollywood weddings to remember, leading to a rise in embroidered lehengas in pastel colours, a wave apart from the gorgeous reds of the conventional ones. And the trend continues to hold sway even today. 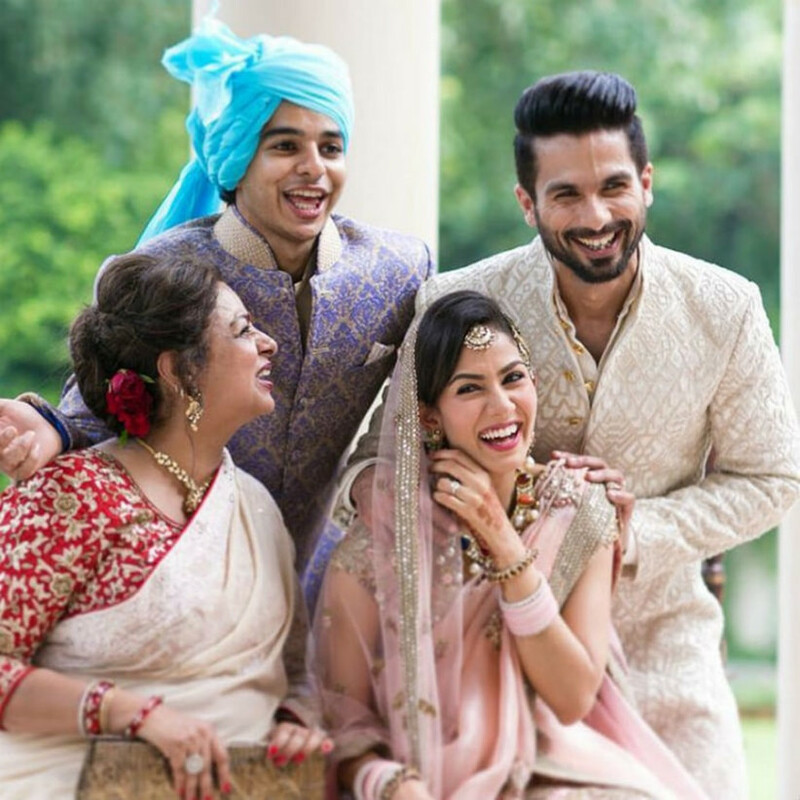 B-town's heartthrob with an enchanting smile, Shahid Kapoor took his wedding vows with Mira Rajput in an intimate ceremony followed by a star-studded reception for all his celebrity associates to join in the celebrations of this milestone wedding. Each detail was an exercise in sheer magnificence - from their wedding invitations to the outfits that they chose to flaunt; especially the old-world European themed wedding outfits. They have made it an unforgettable statement to live by. Channelling her European majesty, Mira Rajput adorned a custom-made lehenga choli by designer Anamika Khanna. Like a boss bride, Mira had it all clear in her mind. 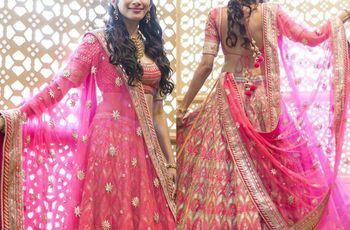 She was confident about the colour palette she wanted to wear and how her bridal outfit would look like, in terms of shades and fabrics and it seems that she executed it excellently and shaped the image of her perfect lehenga all too well. The uniquely designed jewellery she used to accessorise the look was is a jaw-dropping collection that is in vogue and yet she rocked the traditional look admirably. If you’re a go-getter bride, then take a cue from her boss attitude and curate your bridal outfit on your own terms. On the other hand, Shahid wore an ivory shade Achkan with intricate detailing to bring out the mastery of design on his dream-like D-day in our list of Bollywood weddings. This ensemble was designed by his designer friend Kunal Rawal. Ivory is a timeless hue for all of your wedding functions and the royalty of the shade is commendable that is not only appreciated in Bollywood weddings but even when it is off the reels. 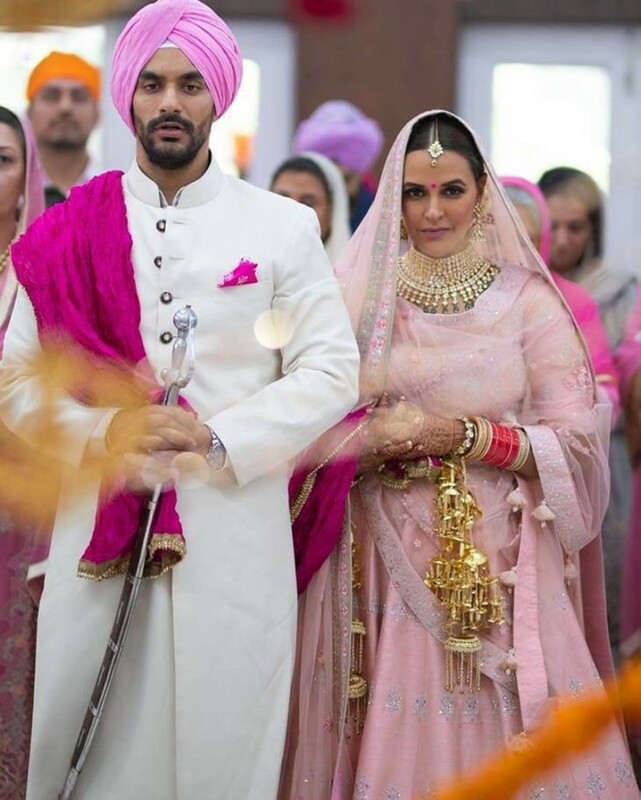 Angad Bedi and Neha Dhupia's wedding came as a sweet surprise for the fans of this B-town diva. The two announced their union in a close-knit ceremony, amidst the company of family and friends, a trend that most Bollywood weddings have been following for quite some time where the wedding is a private affair and the reception for the B-town associates and friends happen later in full-swing. The two held an Anand Karaj ceremony at a Gurudwara, sitting down for the service in monotone outfits. Monotone yet classy and chic. 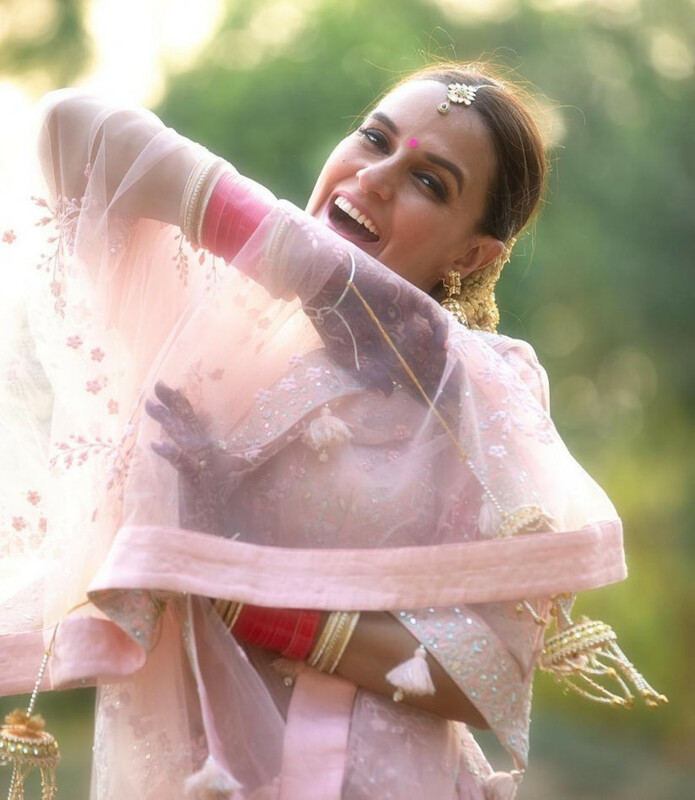 Neha Dhupia wore a custom-made baby pink lehenga designed by Anita Dongre. For that necessary bling, she wore a choker made of emeralds and diamonds. Her outfit is the epitome of sophistication and Ashish Parmar captured this elegant bride from the B-town brilliantly with each photograph vividly upholding the gorgeous shades of the beautiful bride. A grand surprise to us but a remarkable one in the list of Bollywood weddings that stole the hearts of millions. If you’re planning a day wedding, then take inspiration from her bridal trousseau and curate a look for yourself which will outshine all others. The colour palette she chose is a treat to the eyes and the daylight works wonders on the delicacy and precision of work. On the other hand, Angad looked dapper in a white Bandhgala with intricate detailing to bring out the mastery of design. A matching pocket square, Dupatta and turban perfectly complemented her lehenga. He seriously turned some heads around with his wedding silhouette. Take inspiration from his style aesthetic and try to incorporate a Bandhgala at one of your own wedding functions. 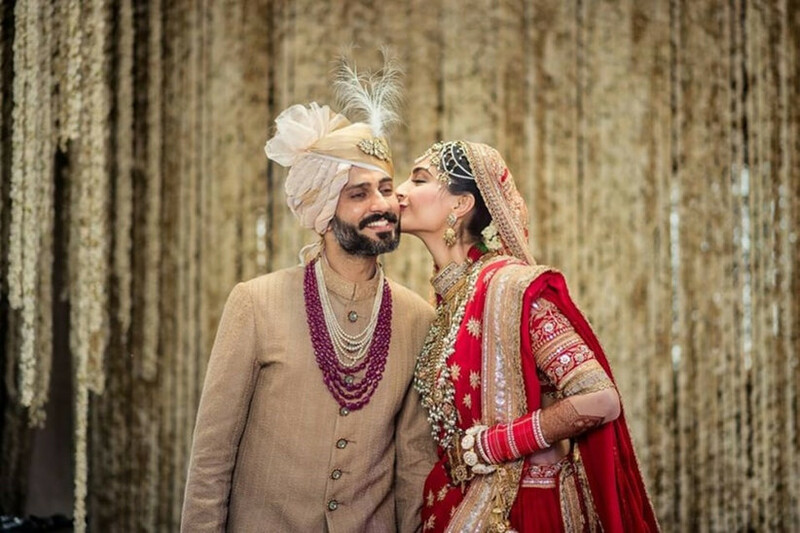 B-towns fashion icon, Sonam Kapoor tied the knot with businessman Anand Ahuja in a star-studded, over-the-top wedding ceremony earlier this year. Their wedding was one of the most talked about and anticipated Bollywood weddings of all times and for all the right reasons. This much-talked-about ceremony was planned by wedding planner Wedniksha and captured by Reels & Frames. Sonam chose to adorn the quintessential red lehenga on her big day. There isn’t a bride who hasn’t donned a red colour outfit on at least one of her wedding functions. Designer Anuradha Vakil wanted to create a masterpiece which would become an heirloom for the bride. And that’s what the hand-embroidered, lotus-embellished red lehenga was all about. 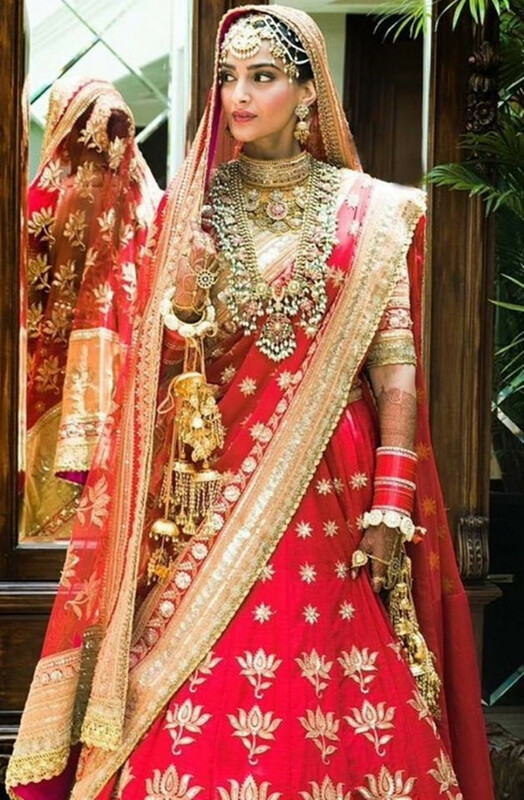 Carrying the baton of the aesthetic red lehnga that is the dream of every girl, Sonam has set a class apart in styling and detailing though her wedding ensemble that is nothing less than royal and dreamy even as one of the over-the-top Bollywood weddings. Red will signify immense power, boldness and a sheer reflection of confidence and boss attitude. It makes you look like a quintessential damsel who is ready to take on the world as you know it. As for the groom, Anand Ahuja wore a specifically curated designer piece by Raghavendra Rathore. 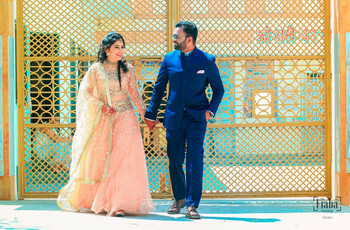 Accentuate your overall appearance by taking your fashion inspiration from Anand Ahuja, as seen in his wedding photos. He elevated his fashion game by wearing a ruby and pearl-studded layered necklace to make his look royal. 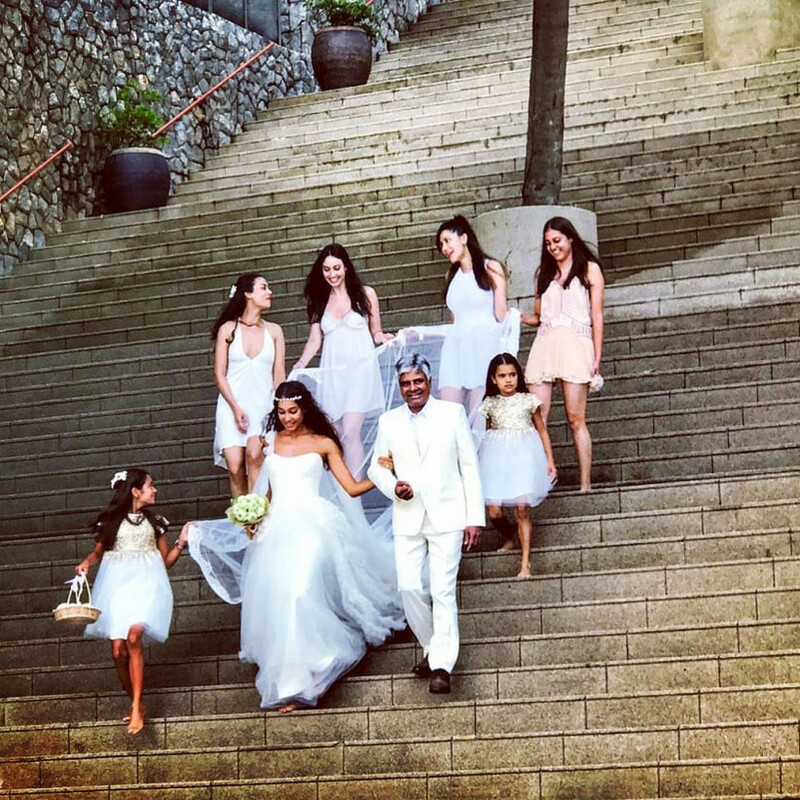 Also known for his extravagant collection of sneakers apart from his remarkable skills and success as a businessman, Anand Ahuja did add to the family of Bollywood weddings quite royally. 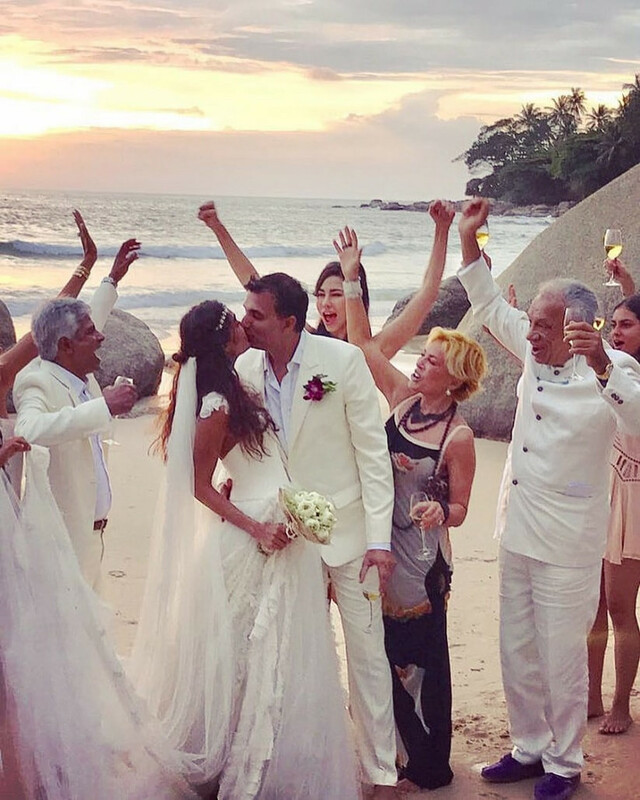 A destination wedding amidst the sultry beaches of Phuket, a damsel and her knight in shining armour, Lisa and Dino called each other man and wife in a close-knit ceremony. Lisa wore a custom-made white bridal gown which is breathtaking, to say the least. Her veil could be seen cascading on the steps as she made her way to her beau on the sultry beach. She added charm and sophistry to her look by adorning a floral tiara as she left her mane cascading sideways in beach waves that defined her face so well. Descending the steps with her father, cousins and nieces, she looked like a vision. Whereas, Dino look stunning in an all-white suit with a floral pocket square. If you ask us, he looked quite dapper in this silhouette. If you’re planning to get married during the day, on a beach somewhere, then play with colours and textures. Couples always tend to seek inspiration from the wedding trousseau of their favourite celebs. Bollywood weddings have seen some extraordinary and bespoke outfits from A-lister designers to some magnificent creations by local artisans. It is an endless sea of possibilities. This year has seen the most inspirational wedding attires in Bollywood weddings and your horizons can be stretched with their ideas. The new age of wedding fashion is a breath of fresh air for all those debonair couples who wish to create a style statement with their wedding wardrobes and you can always have the catalogue of Bollywood weddings in hand for convenience. Find your fashion inspiration from your surroundings or from these Bollywood weddings and hunt for a bespoke outfit.